This Divine form, encapsulating in it the Divine Female’s, and thereby, the Creation’s ‘lalita rupa’ – auspicious, aesthetic and benevolent aspect, represents goddess Annapurna who abounds in food and is the bestower of abundance. Highly innovative, the representation is a brilliant metaphor not only of the iconographic vision of the goddess but also of her personality and divine role. Endowed with several Vaishnava attributes and sometimes Shri Devi and Bhoo Devi making their appearance along her, the ever fecund, ever bountiful Annapurna, the essentially Shaivite deity, though of late emergence and of the subordinate kind, is sometimes seen as the Shaivite version of Lakshmi. Contended sometimes as Parvati’s other manifestation and at other times as one of her subordinate divinities the golden hued, brightly costumed and gorgeously bejewelled Annapurna is revered correspondingly sometimes as Shiva’s consort and at other times as the goddess strongly associated with him. Both these aspects of Annapurna powerfully reveal in her early medieval sculptures, especially in medieval temples in Central India where she has been profusely sculpted. In some of the relief-panels she occupies central position whereas Shiva and Ganesh occupy the space above her, obviously as her family deities, she stands dedicated to, but other goddesses, even a form of Parvati, are sculpted in the space below her on either side usually in a posture of paying her homage. Contrary to this, in some other sculptural panels she has been represented as paying homage to Parvati who has been usually represented in the centre as engaged in ‘panchagni-tapas’ – performing penance in the midst of the five forms of fire. 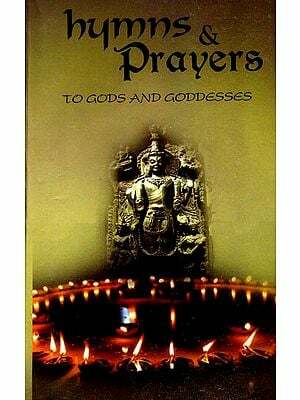 Her association with Bhairavi has given to the personalities of both, Bhairavi and Annapurna, absolutely different dimensions and a new identity to their associated form known as Annapurneshvari-bhairavi. Annapurna is primarily the goddess with a domestic setting and more than anything else belongs to kitchen, and her basic function is to satisfy her husband’s hunger, that is, Shiva’s. Shiva is Pashupati – Lord of all creatures, correspondingly by extension, Annapurna’s primary function is to satisfy the hunger of all creatures, Shiva is whose Lord and who are his inherent parts. Annapurna is associated also with Chinnamasta for like Annapurna Chinnamasta is also the goddess who feeds but unlike Annapurna, and also Shakambhari for that purpose, who only feed and are not fed, Chinnamasta feeds but is also fed. It is for such reasons that in South and some other parts Annapurna sometimes occupies a position in popular worship tradition, if not in hierarchy, higher to Bhairavi or Chinnamasta. With her benign form, not the fierce, as Bhairavi’s, or repulsive, as Chinnamasta’s, Annapurna is the kind mother inspiring love and devotion. Strangely, major features of her image, iconography and anatomy, are almost the same in her contemporary representations as they were in these early medieval sculptures, perhaps because her image did not transmigrate from the domain of elite to the tribes’, or to the masses, that have been more often responsible for revolutionizing their deity-images rather than the elite. Contrarily, they realised Annapurna’s presence, not in an anthropomorphic form, but merely in ‘Anna’ – food to which they bowed every time they had it. Hence, the image of Annapurna still has the same classical flavour as her medieval iconography had. This contemporary image of the goddess, rendered in a different medium and by using a different technique, rather the technique borrowed from the European world, abounds in same ingenuity and classicism as did her image in early medieval sculptures. 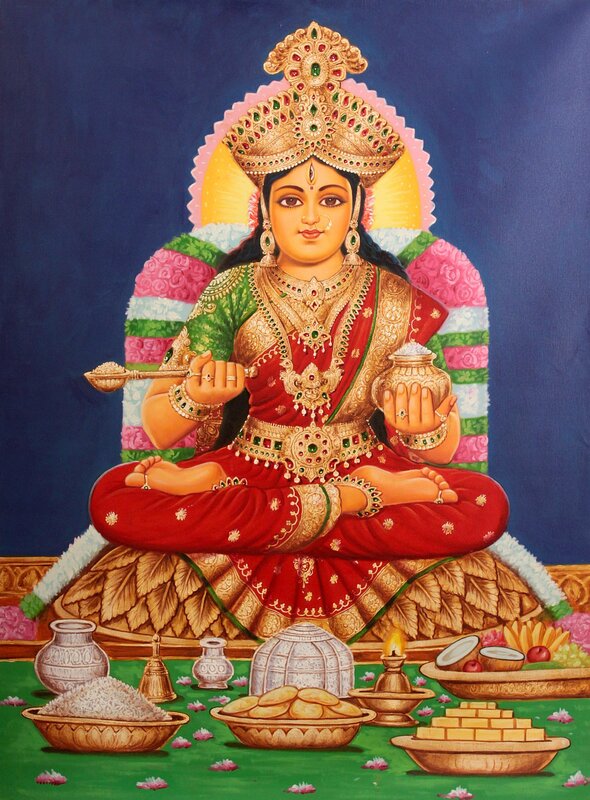 Almost as a rule her image has been conceived with two arms, carrying invariably in the right, a ladle, and in the left, sometimes a rosary but more often a pot containing food – the attributes of Brahma, though as in this painting her pot does not have attached to it a spout and a handle, as has Brahma’s pot – ‘kamandala’, nor her ladle is meant for making offering to Agni in the course of ‘yajna’ : the sole function of Brahma’s ladle. Filled with food Annapurna’s ladle serves the food and satiates the hunger of all creatures. No other deity in the pantheon has such personalised imagery and attributes as Annapurna has. The gold-complexioned Annapurna has been conceived, as in this painting, as the young mother with lustrous timeless youth and unparalleled beauty abounding in inexhaustible stores of food around her as also in her being; hence, she has been conceived with golden jar-like breasts filled with milk and around her lay pots, trays, bowls – all full of food. Nava-ratnas – nine jewels, the whole range of precious stones, symbolically represented in the buckle of the golden girdle that the goddess is wearing in the painting and is an essential component of her imagery, define her ornaments, and a pad made of leaves, her seat, that is, all that the earth contains in its womb, and nature, in its store, are at Annapurna’s command. Besides her own large captivating eyes she has on her forehead the third eye, an attribute of Shiva.